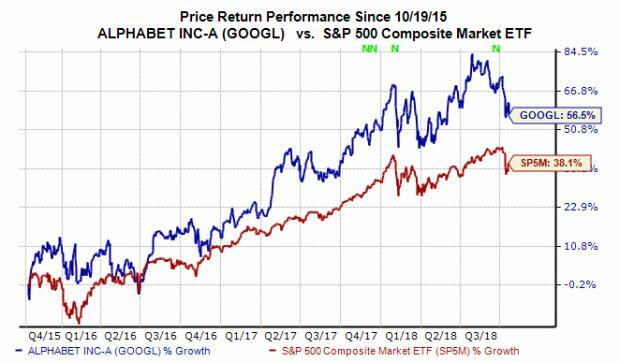 Shares of Alphabet Inc. GOOGL have slipped roughly 9% over the past three months as investors worry that more government intervention could be headed Google’s way. With that said, Google’s parent company looks poised to post strong top and bottom line Q3 growth, while it expands its products push. Google recently launched its next-generation Pixel smartphones. The new Pixel 3 and the Pixel 3XL boast an impressive camera, wireless charging, a better battery, dual front-facing cameras, and more. The new phones hope to challenge Apple’s AAPL latest iPhones. The company also sells an iPad-like tablet product called the Pixel Slate. Plus, the search engine powerhouse recently introduced its new Google Home Hub that allows users to voice-control other smart home products, such as security cameras and lights. Home Hub also features Google’s voice-assistant technology as it fights against Amazon AMZN and others in the crowded home assistant market. Investors should also note that Google is considering plans to offer its search engine in China once again. The firm famously pulled out of the world’s second-largest economy in 2010 in order to protest Chinese government censorship, among other things. But the company is reportedly in the midst of deciding whether or not to jump back into China with a tailored version of its search engine to meet Chinese government censorship standards. Google is coming off a quarter that saw its total revenues surge 26% to reach $32.65 billion.The firm that claims roughly 37% of the total U.S. digital advertising market—ahead of Facebook’s FB 20%—posted 24% growth in Q2 ad revenues. Meanwhile, Alphabet’s “Google other revenues” category, which is comprised of the Google Play Store, Google Cloud offerings, and its hardware initiatives, surged over 36% to touch $4.43 billion. Moving on, shares of Google have performed far worse over the last year than some of its tech behemoth peers, such as Amazon and Apple. In fact, GOOGL stock is up roughly 9.5% during the last 12 months, which falls just below the S&P 500’s 10% climb. Google stock has, however, outperformed its industry’s 14% decline. Plus, GOOGL’s recent dip has its stock price resting roughly 15% below its 52-week high. This might set up a solid buying opportunity ahead of its Q3 earnings release. Our current Zacks Consensus Estimate is calling for Google’s Q3 revenues to climb by approximately 22.4% to reach $27.25 billion. Looking a bit further ahead, the firm is expected to see its fiscal year revenues hit $109.6 billion, which would represent a 22.9% jump. At the other end of the income statement, Alphabet’s adjusted quarterly earnings are projected to pop by 9.7% to hit $10.50 per share. Meanwhile, the firm’s adjusted EPS figure is expected to expand by 24% in fiscal 2018. Alphabet has seen its earnings estimates trend upward for fiscal 2018 over the last 30 days, but its Q3 revisions have moved in the opposite direction. These mixed earnings revision trends help Alphabet land a Zacks Rank #3 (Hold) at the moment. The firm does currently sport an “A” grade for Growth and a “B” for Momentum in our Style Scores system, and might be worth considering before it releases its Q3 earnings. Alphabet is scheduled to report its third quarter 2018 financial results on Thursday, October 25.